The most comprehensive system for developing sustainable landscapes, the SITES v2 Rating System, has been released by the Sustainable Sites Initiative(tm) for use by landscape architects, designers, engineers, architects, developers, policymakers and others who work in land design and development. SITES v2 resulted from the continued collaboration among the Lady Bird Johnson Wildflower Center, the United States Botanic Garden, the American Society of Landscape Architects and a large group of technical volunteers. The rating system uses progressive industry standards for landscape design incorporating recommendations from technical experts in the fields of soil science, botany and horticulture, hydrology, materials, and human health and well-being. Landscapes are considered sustainable if they reduce water demand, filter and reduce stormwater runoff, provide wildlife habitat, reduce energy consumption, improve air quality, improve human health, and increase outdoor recreation opportunities. Negotiations are underway with the Green Building Certification Institute to provide project certification to the requirements and a related professional credentialing program for SITES v2. Bartholdi Park's accessibility and irrigation have to be improved and so has been redesigned as a Sustainable Sites Initiative using SITES v2. It will continue to include a demonstration gardens for homeowners using SITES guidelines. Each demonstration will be a synergistic solution for dynamic and holistic systems that can be interpreted for the home gardener, helping improve garden design and maintenance practices nationwide. 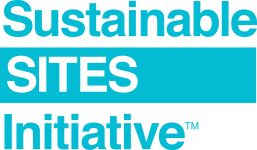 The Sustainable Sites Initiative(tm) is an interdisciplinary partnership led by the American Society of Landscape Architects, the Lady Bird Johnson Wildflower Center at The University of Texas at Austin and the United States Botanic Garden to transform land development and management practices with the nation's first voluntary rating system for sustainable land design, construction and maintenance practices. As SITES guidelines become accepted practices, they will transform the ways we design and build on the land, creating landscapes that nourish life for generations to come. In November 2009, SITES released the nation's first rating system for the design, construction and maintenance of sustainable landscapes, with or without buildings. The SITES rating system represents four years of work by dozens of the country's leading sustainability experts, scientists and design professionals, as well as public input from hundreds of individuals and dozens of organizations to create this essential missing link in green design. The announcement took place at the U.S. Botanic Garden.